NewAir Pure Spring WAT40B BPA Free Hot & Cold Bottom Loading Water Dispenser The NewAir Pure Spring WAT40B BPA Free Hot & Cold Bottom Loading Water Dispenser is the most convenient way to keep icy-cold and piping-hot water close at hand in your home or office. 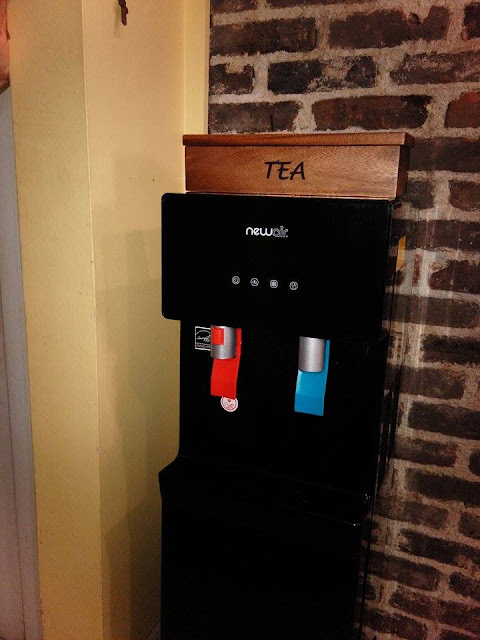 Built by a brand you can trust, the dispenser provides cool, refreshing water on hot days and warm water for coffee and tea on cold days. The dispenser is equipped with a powerful, energy-efficient compressor. It cools water to as low as 39 Degree and heats it up to 185 Degree, so you always have plenty of thirst-quenching water to drink. Built With 100% BPA-Free Materials to Ensure Quality The NewAir WAT40B is constructed with 100% BPA-free materials. BPA is a synthetic organic compound used as a stiffening agent in plastic containers. If it's used in containers that store water, it can seep into the water and cause health problems. NewAir' s BPA-free water coolers let you avoid this risk. They provide pure, clean, tasty water, as well as peace of mind. We're committed to providing customers with the highest levels of quality and safety in all our products. Child Safety Lock Installed on Hot Water Faucet Because the WAT40B dispenses water at an extremely high temperature, we've installed a safety lock on the hot water faucet. The lock prevents children from accidentally dispensing hot water, protecting your little ones from accidentally burning or scalding themselves. It guarantees a safe and reliable experience for you and your family, a standard feature of NewAir products. Being a fan of bottles water but wanting not to have all the empty water bottles in landfills, I was happy to get this NewAir WAT40B Pure Spring BPA Free Hot & Cold Bottom Loading Water Dispenser, Black. It also comes in white and there are other styles as well. 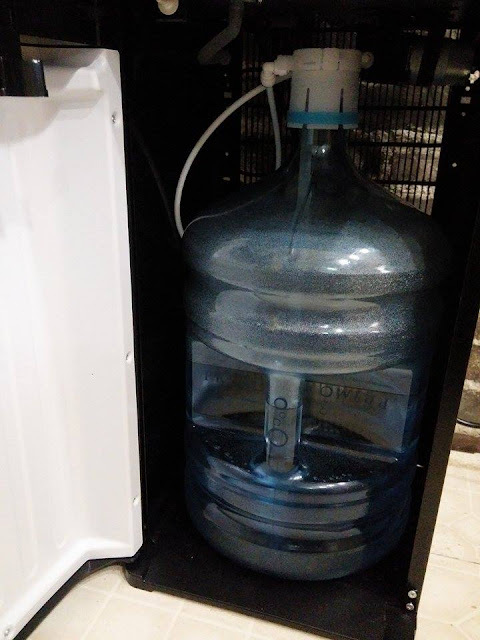 I chose this style because the 5 gallon water bottle is underneath the unit hidden away. 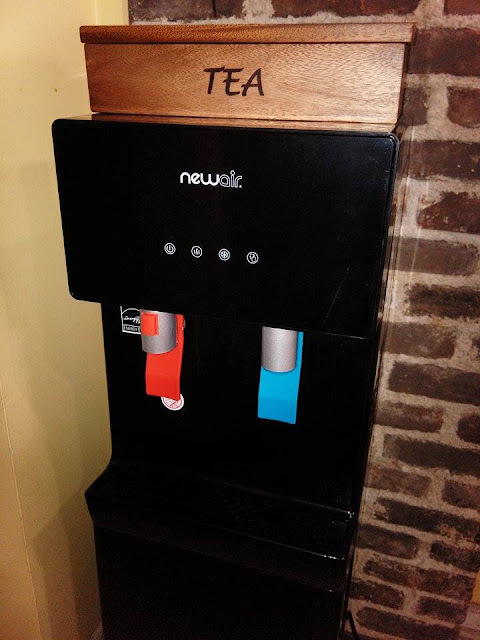 I love how this water dispenser looks, it is compact, sleek and modern looking and fits nicely in my kitchen. I like that it has both hot and cold water, the hot water is steaming when it comes out and the cold water is very chilly when it comes out. I really like that I can easily get either one with just a press of a button or two. I like that I do not have to pick up a big 5 gallon bottle to set it upside down on top of the unit. I like that it is just off the floor, easy to put in the unit and simple to take the cap off and place the tube inside and with a click the water is ready to dispense. With 3 little ones in the home, I like the hot water safety precautions. I like that I can simply turn off the hot water with a flick of a switch on the back and it still has the red button that must be pushed at the same time to dispense the hot water, I really like this feature for the safety of my family. 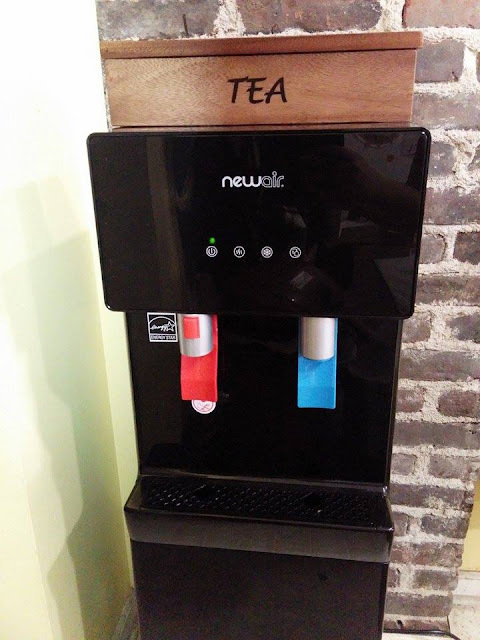 This is a very convenient water dispenser with an easy to clean removable drip tray and simple to wipe down exterior.